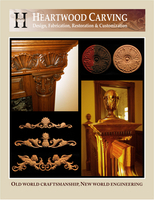 #FZ-LV: A carved wood frieze molding of a simple and elegant running olive leaves form. #FZ-FLUR: A running pattern of alternating acanthus flourish. Shown in 4" width x 3/4" thickness beech.